At STS Aviation Group, a deep love for the aerospace industry fuels our company’s passion for continued growth and expansion. We take pride in our work and it shows inside the divisional statistics and strategic initiatives outlined throughout this newsletter. We hope you enjoy it, and thanks in advance for your engagement. The year is off to a great start for STS Aviation Group, and if you’ll indulge me for a moment, I’d like to tell you the reason why. It seems like yesterday that companies across the aerospace industry were begging for every piece of business they could get. Today, however, new opportunities are plentiful and organizations like ours are flying full speed ahead. STS’ customers / partners range from major airlines and OEMs to large MRO facilities and small 145 repair shops. Almost all of them are reporting more opportunities than they can take advantage of, which is a very good problem to have. Knowing this, I believe it’s the optimal time for our company to reward those customers, vendors and business partners who have stuck by our side – even through the tough times – over the past several years. And in 2015, we plan to do just that. Now more than ever before STS has the ability to pick and choose the business relationships that make the most sense for our company’s prolonged growth and sustainability. This yields positive results for all involved because it gives us the ability to align our business and its service offerings alongside those provided by the companies that form strategic partnerships with us. This quarter’s newsletter is focused on the corporate goals we’ve established throughout 2015. In the articles that follow, you will get the chance to see for yourself why we’re projecting this year to be the best one yet for STS. Enjoy, and please feel free to contact me directly if you have any questions. Make no mistake… what we do at STS Aviation Group matters. Whether it’s giving someone the opportunity to provide for their family by putting them to work, or perhaps it’s the selling of certified aircraft and engine parts that help air travelers get to their destinations both on time and safely, the projects we embrace and the efforts we expel have a lasting and positive ripple effect. Hello, everyone. My name is Rachel Hood, and I’m the Manager of Technical Recruiting at STS Engineering Solutions. Today, I’d like to briefly look back at the accomplishments our Engineering Staffing and Direct Hire divisions achieved in 2014 before jumping forward to take a glimpse into the future. Since this is my first time writing a newsletter article, it may be a bit of a bumpy flight, but when it’s all over, we will have landed with more knowledge than we started; making it an altogether productive journey. Last year was an exceptional period of growth for the staffing side of our business. We set the bar high by establishing lofty goals aimed at growing our internal recruitment teams as well as increasing our active headcounts. Looking back, I am proud to say that we not only met those goals, we exceeded them beyond all measure of expectation. To get a full recap of last year’s staffing achievements, please click here. Looking forward, 2015 is already shaping up to be another amazing year. We have set the bar high once again and have put a comprehensive plan in place aimed at achieving a new set of goals that will fly us even further down the path of prolonged success. When considering the most crucial aspects of being a recruiter and placing them alongside insight and feedback from key team players, our staffing departments have collaborated to create a new KPI (Key Performance Indicators) program that will help motivate and inspire our Technical Aviation Recruiters. The new program has been designed to streamline workflow efficiency while offering top-notch support to each of our customers / clients. The result will no doubt yield more jobs for qualified aviation professionals as well as increased business opportunities and heightened revenue for our company. The road ahead is not without its challenges, however, but as we’ve continually shown in the past, our recruitment teams tend to thrive when the pressure is on. In an effort to highlight some of the obstacles we’ll face in the coming year, I offer the following. More and more lately, STS’ Engineering Staffing department is being tasked with recruiting skill sets that are non-engineering related. These skill sets include maintenance control, planning, logistics, materials, inventory, etc… And while stepping outside of our comfort zone could have proved problematic, our staffing team has taken on this challenge with great enthusiasm and is doing a fantastic job. Now some have said that a recruiter is only as good as the tools in their arsenal, and I tend to agree with this statement. That’s why STS has already invested – and will continue to invest – a considerable amount of time, energy and resources adopting new staffing technologies as supplied by companies like LinkedIn, Monster, CareerBuilder, Aviation Job Search, etc… These tools will help our team(s) build upon an already growing database of aviation professionals while also giving us the ability to harness the power of modern technology in an attempt to find the most qualified candidates for our clients. In addition to the new technological tools we have in place, STS’ Engineering Staffing and Direct Hire divisions are also committed to the continued growth of its recruitment teams. We have plans to hire more Recruiters and Recruiting Coordinators in 2015; a result that will no doubt yield increased personal attention for every prospective candidate and a heightened sense of individualized service for our customers. Here’s to another record-breaking year for STS Aviation Group’s Engineering Staffing and Direct Hire teams. Together, we place in demand aviation professionals into rewarding careers, and those efforts will not cease. 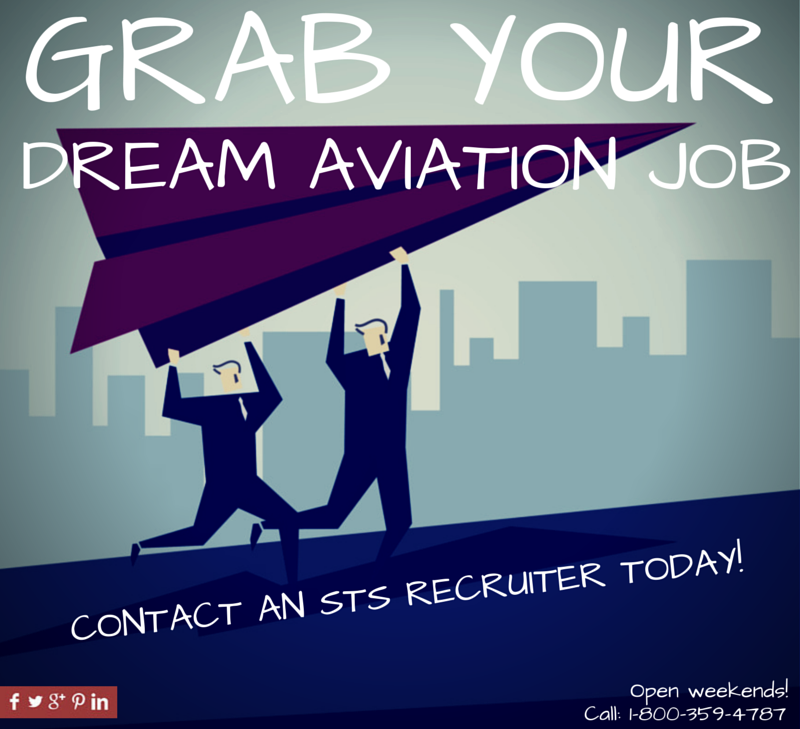 After all, as the world’s leading staffing organization within the aerospace industry, STS stands proud of its ability to seek out and find the most highly-sought after aviation personnel in the business so your company can do what it does best… keep flying! STS Engineering Solutions (Aircraft Services) has established an aggressive 2015 growth plan, and if you’ll stick with me for a few moments, I’d like to tell you more about it. The growth I speak of was projected by using various pieces of key data as supplied by our existing U.S. customer base as well as the expansion of our services, predominantly in South America. Currently, STS Engineering Solutions (STSES) is supporting approximately 85% of all U.S. regional operators and 70% of legacy carriers. Based on our commitment and accomplishment of providing cost-effective and prompt 24/7 aircraft engineering support, our department’s projected 2015 growth reflects 15% additional engineering support for our valued U.S. customers. This comes under the category of 24/7 Liaison Engineering as well as Major Alterations, STCs and PMA projects. Our international growth in 2015 is focused on the Latin American market. This is primarily based on our current foothold in Brazil. STSES is projecting 25% – 30% total budget revenue growth in the region via 24/7 Liaison Engineering support alongside a slew of additional projects. The FAA/ANAC Bi-Lateral Agreement presents a challenge for improved relations, but we’re confident that we will overcome this challenge and continue to establish a strong foothold in South America. In addition to what’s already been mentioned, STSES has its sights set on supporting Europe and Asia in the very near future. We’re currently attending international MROs to become acquainted with, and further define, our strategic growth plan in those regions. We must have our infrastructure soundly in place to attain our commitment of cost-effective and responsive engineering support, and we are coming very close to seeing our efforts blossom into practical aircraft engineering solutions provided to customers all over the world. My good friend and colleague, Rachel Hood, already spoke about the staffing side of our business from an engineering and direct hire standpoint. Now it’s up to me to do the same for the touch labor side of things. Bear with me, folks, I’ll do my best to keep this both informative and brief. STS AeroStaff Services continues to grow exponentially year after year. The driving factor behind this growth is centered around our teams’ ability to not only meet the needs of clients but to also provide the infrastructure required to exceed customer expectation both now and in the future. Our business partners’ peace of mind is the key to our success, and our mission to be the premier provider of aviation labor remains our primary commitment. At STS AeroStaff Services, we strongly believe that it is mutually beneficial for our team and its clients to successfully fulfill the opportunities we’re afforded as expediently as possible. This applies from a hiring perspective, a quality perspective and a retention perspective. To better support this belief in the coming year, a major step was taken to provide the platform by which we intend to meet these needs. In January of 2015, STS officially opened a new office in Denver, Colorado, in an effort to provide West Coast clients and job seekers improved and extended support. STS has also doubled the size of its recruiting departments over the last 12 months. This fact helps to ensure that we’re not only locating qualified candidates more quickly but also taking every step possible toward meeting the ever-growing requirements of our clients. With the addition of new technological tools as well as a massive increase in internet advertising, social recruiting and other inventive strategies, STS AeroStaff Services will continue to expand our brand’s exposure and increase its reputation as THE dominant, tier-one provider of aviation labor across the industry. The candidates that we work with are just like our clients. Time is, quite literally, money for them both. STS has been able to take additional advantage of the progressive changes we’ve implemented in an effort to provide an accelerated process that enables prospective candidates to locate the best jobs available based on their individual qualifications and overall experiences. The services we provide as a company are continually modified and our processes updated. This is done in order to get our candidates submitted / hired / started on their new assignments quickly. The additional support that we’ve implemented will help reduce delays, improve attrition rates and increase the percentage of approvals we receive from our clients. This will not only result in more stable relationships, it will also yield less money being lost due to missed opportunities. STS AeroStaff Services will continue its mission in 2015 and will take steps to both improve and shorten the response times between the receipt of our client’s manpower requirements and the placement of technicians at their facilities. It is hard to believe that we have closed out the 1st quarter of 2015 already. In reviewing our goals and accomplishments established for the year, we are proud to say that we are on the right track and moving full speed ahead toward making 2015 another strong and successful year for STS Component Solutions. Expand our newly launched Ground Power (Aeroderivative) business. Integrate the newly acquired Air-Pro Hose Business into our organization. All of these initiatives are trending in the right direction as we have a strong pipeline of opportunities already identified. We have closed out a strong Q1 in our OEM Distribution business as we are performing above our budgeted levels and exceeding our record performance levels established in 2014. We are also proud to announce that we have successfully launched a new solution-based service program in March that has strong growth potential. It is a service that we feel has a strong global demand, and we expect the program to play a very large role in our growth and expansion throughout the year. Our Ground Power business that we launched in Q4 of 2015 is very active in locating and acquiring assets and developing the strategic relationships to assist the further growth and development of this business. We have some exciting developments in the pipeline that will occur in Q2 and lead this business to new heights. Our Engine Asset business continues to be a key contributor to our growth strategy, and our Engine Product Line team continues to locate and identify new asset opportunities to expand our engine product portfolio. In the last two quarters of 2014, STS Component Solutions closed on five new consignment / large inventory purchase programs. We have been very active with the receipt and inspection of these inventories and have developed marketing strategies focused on maximizing the ROI on these programs. Last but definitely not least, we are very proud to announce that the Air-Pro business we acquired in late December is integrating into STS Component Solutions, and we are very happy with the progress we have been able to achieve. In addition to the strong brand recognition of the product and business we have acquired, we also have a very strong team of individuals that are committed to its success. We have been busy integrating a new ERP system and establishing some key strategies and structure to the business so that we can capitalize on the synergies that can be achieved with our existing business. We are proud to say that STS Air-Pro is exceeding our targets thru Q1, and we are preparing ourselves for moving the facility to a new location in Q2. We see a very bright future for this business and have some very interesting opportunities in the pipeline that will fuel its continued growth. It is very evident that we have had a very busy Q1 to start 2015, but with the strategic targets identified and the teams we have in place, our company is off to a great start and expects to have a tremendous year. STS Line Maintenance‘s goals for 2015 include a growth strategy that will allow us to build upon our existing client base across the U.S, expand our company’s reach and increase our customer service points. We started the year out strong by opening of a new line station in Miami (MIA). What’s next? Opening a line maintenance station in Atlanta and possibly Orlando, Florida, by the end of the second quarter this year. We are continuing to work with our customers to focus on their needs and offer solutions that allow us to grow with them and provide excellent customer service at the same time. The special projects we’ve been working on with a significant WiFi company continue to grow. With more opportunities in multiple cities and multiple lines, nose to tail, these projects allow us to offer 100+ job opportunities inside each community we work in while also increasing our company’s visibility.The world has changed and no one wants to be off the grid for any length of time. This fact yields amazing opportunities for us all. One last thing… I am very proud to report that STS Line Maintenance has been named a finalist for this year’s ATE&M Award recognizing the Best Line Maintenance Provider in the world! This great honor is due in no small part to our employees’ consistent hard work, loyalty to the company, pride in themselves and complete dedication to the exceptional customer service we offer. Whether we bring home this illustrious award or not, each and every one of us takes pride in knowing that our colleagues and peers have already recognized STS Line Maintenance as one of the best aircraft service providers in the business. Well, that’s it for the first quarter. See ya on the flight line! Work hard, play hard and stay safe. In this post, we would like to spotlight one of STS Aviation Group‘s Recruiting Team Leads, Jason Boyd, and introduce 16 new corporate employees whom have all been hired in the past few months. I lead a team of Technical Aviation Recruiters who commit themselves to hiring the most highly sought after and qualified aircraft maintenance technicians in the business. This is a tough one for me. I really love putting aviation professionals to work all over the country, but perhaps what I love most about STS is the people I get to work with. My team members are some of the most dedicated individuals I know, and I’m proud to enter the recruiting trenches with them on daily basis. The Aviator with Leonardo DiCaprio… by far. The incredible story of Howard Hughes’ life is fascinating to me, and I love how the movie draws a very fine line between genius and insanity. Great flick! Check it out if you haven’t already. I really enjoy coming into work every day. A lot of people say that but few actually mean it. I’m one of the few. But as much as I like being inside the office, the most memorable moment I have as an STS employee happened away from my cubicle. Every year, STS throws a series of parties for its staff in an effort to bring us closer together and celebrate major accomplishments. This past December, my wife and I attended the STS Holiday Party and had one of the most enjoyable nights of our lives. I’ll never forget it! That’s me and my wife at the 2014 STS Holiday Party. I’m not the handsome guy in the middle, unfortunately, I’m the other guy on the left. Carole comes to STS as a born-and-raised Jensen Beach gal. She not only attended Jensen Beach Elementary but was also a member of the first graduating class of Jensen Beach High School. Carole received a B.S. degree from Florida State University and a MPA from Florida Atlantic. She loves thrilling adventures, whether they’re intentional or spur of the moment. With a passion for travel and a wanderlust heart, Carole joins our team as an Account Manager for STS AeroStaff Services. Carole believes working for STS is a great opportunity and looks forward to all the joys being employed by the company will bring. Russ has been living in the Milwaukee area for the past 10 years. He comes to the STS Technical Services’ team with 7+ years of prior experience in contingent placement and RPO services. Russell loves spending time with his wife and puppies, and when they’re all not driving him crazy, he’s busy recruiting engineers for a major motorcycle manufacturing client that recently partnered with STS Technical Services back in February of this year. Mark holds a B.S. degree in Aerospace Engineering from the University of Minnesota and is originally from the Minneapolis area. In 20 years with Northwest / Delta, he held various engineering and vendor management positions. Immediately prior to joining STS, Mark worked for Airworthy Aerospace as Manager of Engineering and Quality. Mark will be relocating to Tucson, Arizona, and enjoys spending his free time outdoors golfing, biking, fly-fishing, hiking and traveling. Being a native Minnesotan, hockey is his favorite sport, a fact that will not change when he moves to the desert. Mark works as a Principal Engineer for STS Engineering Solutions, which means he provides liaison engineering support to airline customers primarily located in Tucson. Robby Bush has been with STS since November, 2014. He was hired as the VP/GM of our Line Maintenance division, which supports 11 stations and multiple project sites across the country. Robby truly believes joining STSLM was a great move for him and his family. He currently lives just outside of Atlanta, Georgia, with his lovely wife Kathy of 26 years.They also have two wonderful children aged 24 and 22. When he’s not at work, Robby loves to spend his time golfing, fishing and talking peoples’ ears off; a fact anyone who knows him will lovingly support. Robby is a welcome addition to the STS Line Maintenance team, and we’re very excited to have him on board. Jessica is an Assistant Program Manager for STS Technical Services. Anyone who knows about her position can tell you just how challenging it can be, but she really enjoys the work she’s doing and fits in perfectly with our Brookfield team. Jessica is originally from Green Bay, and in her spare time she enjoys making music and entertaining her little furry family (We’ll let your imaginations run wild as to what the heck that means). Jessica recently purchased a new home and says there are always projects to tackle outside of work since the house she bought was originally constructed in the 1920’s. This Old House has quickly become one of her go-to shows, and if you’ve never seen it before, it may be worth checking out if you’re into DIY, home renovation projects. Thomas is originally from Vermont but has been living in Port Saint Lucie, Florida, since high school. When he is not working hard as one of the newest Group Controllers for STS Component Solutions, Thomas enjoys spending time with his wife and kids. “We really like to kayak, ride motorcycles and watch sports together,” Thomas said. Brian is from North Potomac, Maryland. He graduated college from High Point University in High Point, North Carolina, with a Bachelors degree in Human Relations. When he is not busy at work helping our team recruit top-notch aviation professionals inside our Denver office, Brian enjoys taking to the the mountains so he can hike and ski. Frank Hechavarria was born and raised in Miami, Florida. He loves the Miami Heat and was deeply saddened when they failed to secure the last spot in the Eastern Conference playoffs this year (cue the world’s smallest violin). Frank’s Aerospace career began with Air-Pro in 1984. His passion has always been sales and customer service. His role as Account Manager for STS Air-Pro calls upon him to master and engineer hose assembly part numbers for cost estimation in support of customer sales requirements. For fun, Frank spends as much time as possible with adorable seven-year-old son. Carlos is from Venezuela. He is currently studying as an international student at Eastern Illinois University. When he isn’t busy learning the ropes as STS’ newest Junior Web Developer, Carlos likes to spend his time jamming to good music (he plays the piano and guitar) and enjoying the outdoors. When the weather is bad, he likes to read as much as possible and loves to cook. Megan is from Dallas, Texas. She moved to Denver in 2013 and started working for STS in January 2015. When she is not at work, she enjoys skiing, hiking and watching a good movie with friends. Dave Gluskin was born and raised in Florida. He has 13 years of recruiting experience under his belt, and has worked on both sides of the fence as a headhunter and corporate recruiter. He also owned a small business for 5+ years. When he is not at work, Dave loves spending time with his wife Dawn and their two daughters, Calista and Delilah (ages 7 and 2). A classically trained musician, Dave spends a great deal of his free time writing music. He also loves every kind of outdoor activity and follows sports with a passionate fervor. Currently, Dave is a Technical Recruiter with STS Technical Services. He is working on site at a client location in Melbourne, Florida, and acts as both a manager and recruiter. Carol lives in Brookfield, Wisconsin, with her husband and daughter and is thrilled to be working at STS Technical Services. She admittedly loves her 15 minute commute and enjoys a wide variety of music; a passion that includes singing karaoke with her sisters, going to concerts and supporting her husband’s band. When she isn’t busy at work, Carol likes to spend her free time with family and friends. She also knows how to give a great Mary Kay facial just in case anyone’s interested. Chelsea Bryant is from Moultrie, Georgia, and is the proud mother of a handsome 3-year-old by the name of Micah. When she isn’t busy at work helping to find the most qualified aviation professionals for our clients, she loves to sing, dance and have some good old fashion fun. Chelsea joins the STS AeroStaff Services’ team as its newest Recruiting Coordinator based inside our Denver office. Myles is from Billings, Montana, and he’s a huge outdoorsman who enjoys anything from basketball to hiking and fishing. He likes attending concerts and sporting events because he really loves experiencing new music and watching pro teams play. A Sheet Metal Mechanic by trade, Cristo Heatherdale (outside of work he is known as Chris) is, quite literally, from everywhere. He grew up in a government family and then certain life choices slung him around this tiny world. Cristo is currently a Recruiting Sourcer for STS AeroStaff Services who loves long walks on the beach (or rocks since there are no beaches in Denver) and spending countless hours listening to Journey (That’s right… Journey). Born and raised in Chicago, Wilton not only has a cool name, he’s a super sharp individual with a degree from the University of Kansas. Wilton has a self-proclaimed love for the mountains and snowboarding, a fact that originally brought him to the beautiful state of Colorado after finishing school.